In my last blog article, I wrote about the mosaic tile floors of Fishborne Roman Palace in Sussex, England. This article will explore how ancient designs still have a place in modern life. 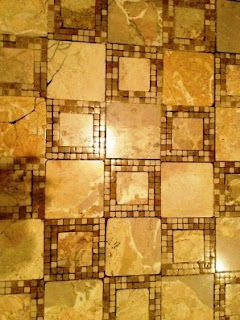 Unlike the Roman rulers, most of us do not have the time or money to have elaborate tile mosaics fashioned for our floors. However, all is not lost. While the cost of replicating an ancient masterpiece may be beyond our means, we can still enjoy the patterns on our own floors. Patterns from antiquity can be adapted to the materials used today. 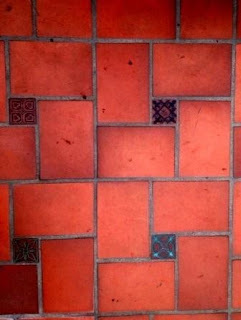 Let us consider the humble, hard-wearing cement tile that is available in ever increasing designs and patterns. 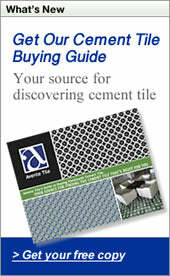 Typically, cement tile comes in 8" x 8" and 10" x 10" sizes. To recreate the old patterns, on tiles of this size, the first step is to identify repetition in the original pattern. 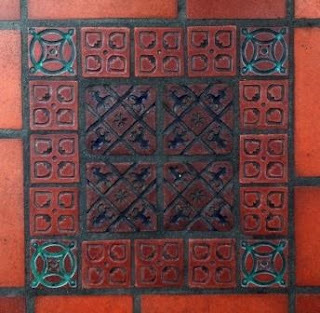 In this first example, the simple geometric pattern of a Fishborne floor has been reproduced in a single tile that works well in a repeating pattern. The colors in the reproduced pattern were chosen from Avente Tile's Heritage Cement Tile Color Palette. A single cement tile replaces hundreds of tessera in a design. In the following adaptation, the pattern was inspired by the first century mosaic in the west wing of Fishborne Roman Palace. The floor was re-buried to protect it. The original was created using black and white tessera. This guilloche border pattern is adapted from a circular design, necessitating the creation of a corner pattern to create a square frame. In this final design, for this article, the pattern requires two tiles. It is similar to the running edge design at the top of this post. It took several attempts to adapt the pattern and, in its current form, there are limitations on how the design can be used. The design was inspired by a floor at Bignor Roman Villa, but similar patterns can be found in other places. Which pattern and color palette inspires you to create your personal design? Joanne Bradley takes an interest in architecture through the ages. Using photography to capture designs and details, she uses the images as inspiration for digital designs. Located 83 miles north of Los Angeles, CA, is a gem of a city nestled between the Pacific Ocean and the Santa Ynez Mountains. 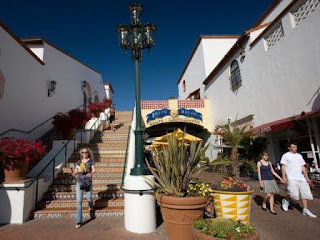 Santa Barbara is considered by many to be the American Riviera as it shares the same dramatic mountains, sparkling seas, lush gardens, white-washed buildings, red-tile roofs and abundant sunshine of its French and Italian counterparts. The city of Santa Barbara got its name from Portuguese explorer Juan Cabrillo when he happened upon the area in 1542. Before and after Cabrillo’s visit, the Chumash Indians populated the coastline, cruised through its coastal waters and lived off the land until Spanish Franciscan monks arrived in the 18th century on their mission-building quest through California. The Franciscans built 21 missions in California, including three in Santa Barbara County: Mission Santa Ines in Solvang; La Purisima Mission in Lompoc; and Mission Santa Barbara, which is affectionately known as the "Queen of the Missions." 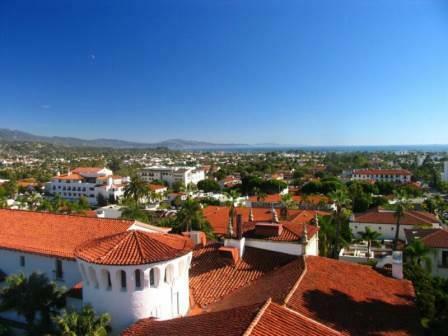 After coming under Mexican rule for 24 years, Santa Barbara became a U.S. territory in 1846. As a city known for its population of outdoor lovers, surfers, volleyball players, and college students, and of course, the rich and famous, the most notable residents are the artisans. These artisans craft everything from foods to art in various mediums. However, those that stand out are the handmade tile artisans. Everywhere you go within this elegant city, you’ll notice hand-painted terracotta and ceramic tiles gracing every niche, fountain, building façade, restaurant, and more. Handmade or hand-painted tile can be found in every part of Santa Barbara, CA. Tile mural by Susan Dunbar’s Custom Tile Studios. 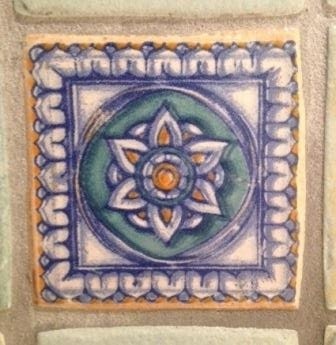 Her tile artwork can be found throughout Santa Barbara County. A closer look at Susan Dunbar's beautiful hand-painted tile craftsmanship. 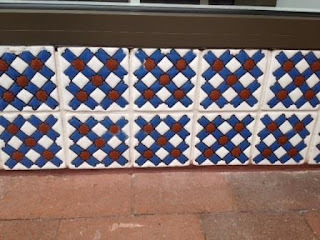 Handmade tile can be found throughout the Paseo Nuevo Shopping Center. An Old World terracotta look is graced with intricately designed inserts. 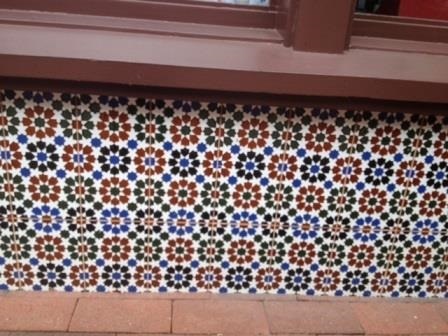 This installation of 6" x 6" tiles resembles Moroccan zillij tiles. Here's another installation of 6" x 6" tiles that beg for attention! 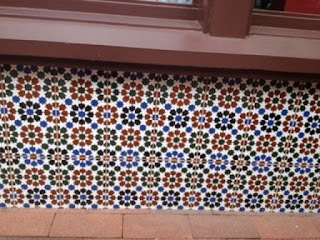 Hand-painted ceramic tiles that reflect the Spanish influence of Santa Barbara. Another example of hand-painted ceramic tile that reflects the city's Spanish influence. An outdoor staircase at shopping center Paseo Nuevo is decorated with Mexican tiles. Image via National Geographic Traveler. Photo by Catherine Karnow. Do you live near an artisan community where the city’s heritage and culture is celebrated? 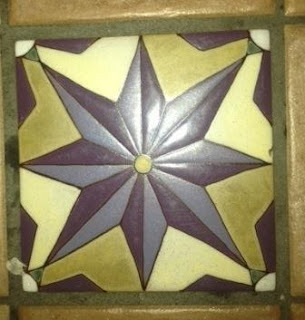 Does handmade tile play an important role in your community as much as it does in Southern California? 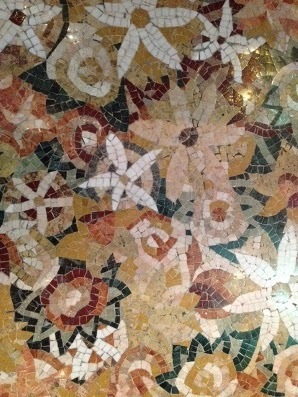 Perhaps the most enduring feature of Roman villas is the mosaic tile work. There are many fine examples to be found throughout Europe. For this short article, I will focus on Fishborne Roman Palace, in Sussex, England. The first century mosaics at Fishborne Roman Palace demonstrate the varied skills of the artisans and enduring beauty of tile. The earliest Fishborne mosaics reflect the esthetic of the time and are fashioned in geometric patterns of black and white. Later mosaics contained tessera (a piece of Roman mosaic) in vibrant colors. Patterns of flowers, animals and mythical creatures were carefully crafted from the tessera. Elaborate boarders of twisted rope and curling vines frame the main designs. When building defects caused floor subsidence, or if the style of the time changed and the floor of an important room was no longer fashionable, a new floor was laid over the old. Mosaic floors prove to be surprisingly resilient to slow subsidence. For those with an interest in history, a mosaic floor can be a treasure trove of information. Areas of exceptional wear mark doorways. Patterns and designs can help define the time when a floor was laid and what the room was used for. The quality of the workmanship identifies the skills and experience of the mosaicists that laid them. Damage to the mosaics at Fishborne Roman Palace can be attributed to later building work at the palace, a fire, and farming during the Middle Ages when the palace was buried and lost. Currently, only the area of the north wing and northern half of the formal gardens at Fishborne Roman Palace are accessible. The northern half of the west and east wings are preserved beneath turf, the southern half of the palace is under private homes, gardens and roads. 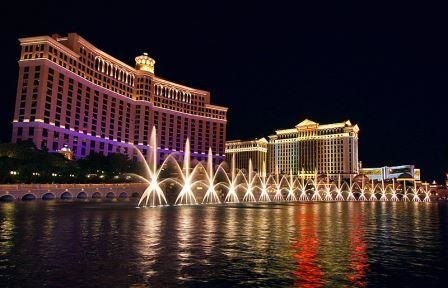 Located in the southern part of the famous Las Vegas Strip, the Bellagio Resort Hotel has dominated its surroundings from the time it opened in 1998 with lush landscaping, classic architecture and elements, and a man-made, eight-acre lake reminiscent of Italy’s Lake Como. With an original cost of $1.6 billion, this Italian-styled property by MGM Resorts International exudes charm, luxury, and aristocracy while simultaneously welcoming the masses into its ornate lobby. Artist Dale Chihuly’s 2,000-piece “Fiori di Como” hand-blown glass sculpture comes to life above the Bellagio's lobby. It’s within this lobby that Bellagio’s true form and nod to the artistic masters, new and old, come to fruition. From the moment guests walk into the lobby, eyes are first drawn to the artwork on the 18-ft ceiling. This is artist Dale Chihuly’s 2,000-piece “Fiori di Como” hand-blown glass sculpture comes to life. As beautiful and stately as the individual glass blossoms are, one’s eyes are then diverted to the intricate mosaic and stone tile work on the floors, walls, staircases and even ceilings – all thanks to the talented artisans of Italian mosaic manufacturer – Sicis. 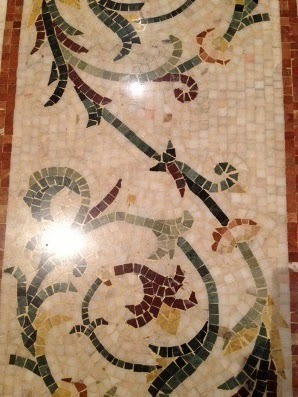 Elegant mosaics and marble tiles adorn the reception area of the Bellagio's lobby. Above the entrance/exit doors, lighting niches are further enhanced by detailed mosaics painstakingly applied by tile and stone masters. From the lobby, guests and visitors are encouraged to stroll through the hotel’s famous Conservatory & Botanical Gardens. With glass ceilings measuring 50-feet high and a space measuring more than 13,500 square feet, the amount of foot traffic the lobby and the conservatory see on a yearly basis could easily surpass a million people! 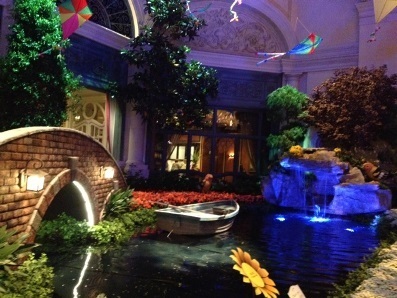 The Bellagio's Conservatory & Botanical Gardens fully decorated for the summer season. 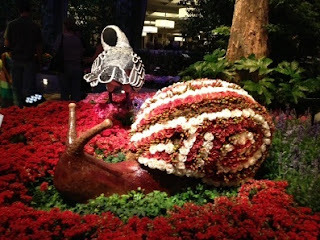 This is one snail I wouldn't mind having in my garden! 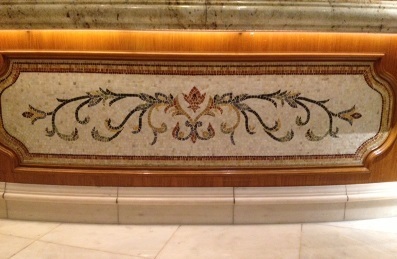 Intricate mosaic designs flow throughout the Bellagio's lobby and reception areas. 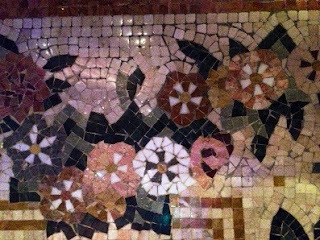 Classic and timeless stone mosaics patterns happily reside alongside the floral motifs. 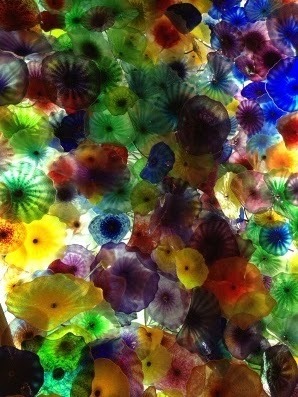 Glistening mosaic stones form floral focal points throughout the Bellagio's lobby and conservatory. Mosaic floral bouquet in the conservatory. Detailed view of the mosaic floral bouquet. 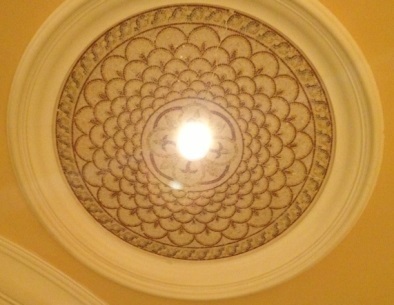 And this is where artistry, talent and experience are integral to a long-lasting and successful installation. With hundreds of thousands of casual visitors coming into the Bellagio’s lobby, wearing everything from flip-flops to stilettos, the role of the highly experienced stone and tile installer becomes even more imperative. With so much at stake, lippage or uneven tiles, are hazards that no hospitality facility can ever afford to overlook or tolerate. Interlaced mosaic stone borders gracefully accentuate the Bellagio's solid marble floors. Hotel lobbies, such as the Bellagio’s, have steadily evolved from an area where people merely check in our out of rooms to that of a public living room where all guests are welcomed on a grand level. Therefore, it’s on this social platform where the master tile and stone artisans’ of Las Vegas-based Carrara Marble Company of America (the stone and tile contractors for Bellagio) proved vital in presenting the hotel’s first impression to newcomers. Do you appreciate the level of hospitality and artistry that hotels and resorts now offer? Have you ever been drawn to a destination because of the variety of tile and stone installations? I'd love to hear your story if you have! Dominican artist Cándido Bidó is the creative force behind the bold Espiral cement tile. Summer is now in full-swing with vacations, short getaways, daily outings, and entertaining outdoors with friends and family members alike. If you're like us, you love to hear the chatter and laughter of a house full of people, especially when a day time gathering spills over into the evening. Similar to the inside of your home, your outdoor space should also reflect your personality and décor style. We have just the right solution for you - ceramic and cement tiles in a multitude of colors, shapes, and motifs. Whether you choose a solid-colored tile, or decide to use patterned tiles for the stairs or stair risers, walkway, water feature, outdoor wall mural, or patio, you can be sure you'll be adding long-lasting, and beautiful aesthetic value to your space. Our handmade cement tiles offer a range of design possibilities. We offer everything from vibrant Cuban tile patterns in contrasting colors, or soothing classic cement patterns in harmonizing colors. Or, pick a pleasing plain tile in your favorite color and enhance with a border to create a tile rug. Regardless of your choice, the end result will transform any outdoor living space into something you would be proud to entertain in or for alone time. In addition to their wide variety of uses, hand-painted ceramic tile offers versatility and value like no other building material thanks to their inherit resistance to abrasion, freeze/thaw conditions, and color permanence properties. Here are several cement and ceramic tile collections to consider when you're ready to update your outdoor living space. This collection pays homage to a deeply rooted tradition of Moorish and Spanish tiles. With their interlaced geometric patterns, these hand-crafted tiles are designed and made in the USA. We offer an expansive selection of patterned cement tile, relief and molding cement tile and solid color cement tiles to coordinate with any decor. Choose from traditional Cuban, artist series, geometric, classic and mission cement tile patterns as well as cement tile fragments. Our rustic pavers have the rich look of classic clay bisque tiles that have been used in Spain, the Mediterranean, and northern Africa for centuries. With these pavers, you get the durability of cement, combined with a broad color pallet, and a range of sizes and shapes. Similar in their hand-crafted workmanship to our line of Arabesque Cement Tiles, our Clay Arabesque Ceramic Tile collection pays homage to its Moorish and Spanish tile roots. They can be customized with traditional unglazed bisque, rustic glazes, glaze blends, and more than 50 studio glaze colors. 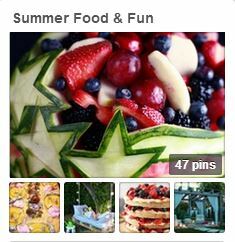 Summer is definitely in full-swing with energy like no other season. For this month's Pinterest focus, we chose the boards that best represent the season where the lines between outdoor and indoor living spaces are blurred, pool and beach days outnumber work days, and the exuberance for exploration is enhanced by the extended ours of sunlight. 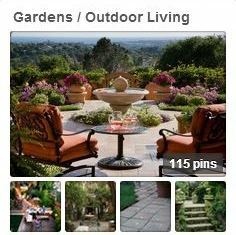 With that same energy comes the willingness to renew or update outdoor living areas. Whether you embark on a small or large project, Avente Tile is here to help you. Our extensive Design Ideas gallery features a large collection of projects showcasing our handmade and hand-painted ceramic tile, cement tile, decorative tile, mosaic tile, and so much more. Let us know how we can assist you!